The nearly full moon shines near Utah's Mars Desert Research Station, Jan. 14, 2014. The moon will officially turn full at 4:11 Universal or Greenwich Mean Time (12:11 a.m. EDT) on June 13th. So, if you live in the Atlantic or Eastern Time zones of the United States and Canada, the full moon will indeed occur on Friday. However, if you live farther to the west and your clock observes Central, Mountain or Pacific Time, then the moon will turn full on the previous day …Thursday, the 12th. 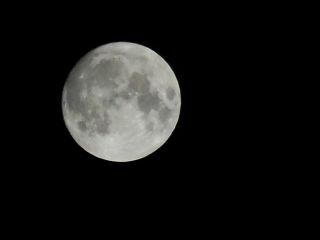 Tonight (June 12), the online Slooh community telescope will hold a live webcast on the June full moon. The two-hour webcast will provide live telescope views of the moon from observatories in the Canary Islands and Santiago, Chile. Slooh astronomer Bob Berman, host Geoff Fox and observatory engineer Paul Cox will provide commentary. My impression is that a very slight out-of-roundness of the moon can be detected, even without optical aid. While Friday night's moon may still appear to be "full," a careful inspection should reveal the terminator (the line that divides day and night on the moon) as a slight sliver of darkness along the western (right) edge of the moon's disk. Full-on the 13th … or is it really the 12th? This Friday the 13th follows "Pelletier's Law," named after stargazer Leslie C. Peltier, who observed that when the first of the month is a Sunday, the month also has a Friday the 13th. As the first day of this month of June 2014 fell on a Sunday, there will be a Friday the 13th. Are you afraid of Friday the 13th? Then you may be one of 21 million Americans who suffer from paraskevidekatriaphobia, the paralyzing fear of Friday the 13th. According to Smithsonian Magazine, fear of the number 13 costs Americans a billion dollars per year in absenteeism, train and plane trip cancellations, and reduced commerce. This month, it also overlaps with the superstitions surrounding the full moon. In case you're wondering about the frequency of a full moon coinciding with a Friday the 13th, it occurs on average about once about every 14.3 years. It last happened in October 2000, closely adhering to the law of averages. However, it won't take place again until August 2049. The full moon of June is also sometimes called the Rose Moon, Flower Moon or Strawberry Moon, according to Guy Ottewell's "Astronomical Calendar" (Universal Workshop, 2013). This month's full moon occurs closest to the June solstice, when the sun is farthest north in the sky. Therefore, the full moon, being opposite to the sun, is at its farthest point south. Because the moon shines through the thick layers of atmosphere near the horizon at this time, it tends to look golden yellow. "This will be the most amber or honey colored full moon of 2014, especially when it rises at sunset Thursday evening," Slooh representatives wrote in an advisory. Ottewell suggests this may have been the origin of the word "honeymoon," because weddings are often scheduled for the month of June. "That phrase dates back nearly half a millennium, to 1552, but one thing has changed: weddings have shifted, and are now most often held in August or September," Slooh's Berman said in a statement. "The idea back then was that a marriage is like the phases of the moon, with the full moon being analogous to a wedding. Meaning, it's the happiest and 'brightest' time in a relationship." Editor's note: If you snap an amazing photo of the moon, or any other night sky view, and you'd like to share for a possible story or image gallery, please send comments and images to managing editor Tariq Malik at spacephotos@space.com.